From Chez Donat, to Sunny Bay Hotel, to Petit Miami: the name may have changed but the warm welcome has always been present. 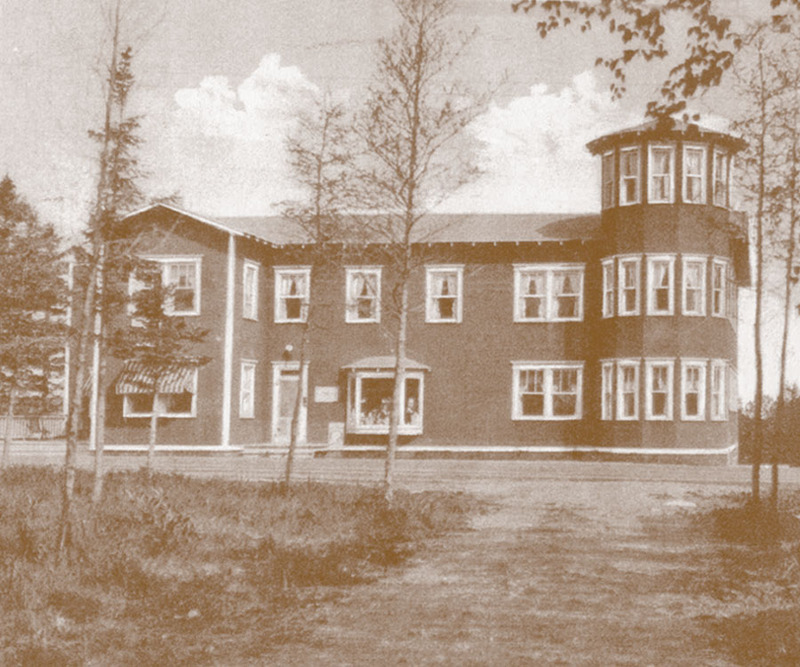 First constructed on the north side of the road at the end of the 1920s, with a unique dancehall on pillars, stretching out over the river, the Chez Donat hotel was a local hotspot for several generations of Metis youth. Moved to the south side of the river at the end of the 1950s and named Sunny Bay, its unusual turret made the hotel popular with photographers. A change of ownership brought the name Petit Miami some years later. Sadly, the hotel burned down in February 2002. Although nothing of the original building remains, the site is now home of the Place Petit Miami restaurant, motel and chalets. Sherrill Shaver remembers going dancing at Chez Donat during the Second World War. 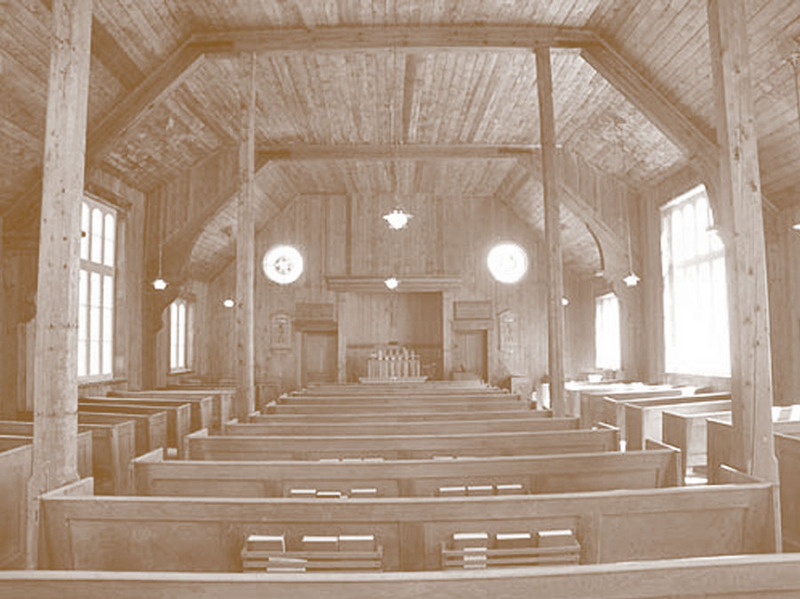 The Metis Beach United Church was built in 1866, originally as a Wesleyan Methodist church. 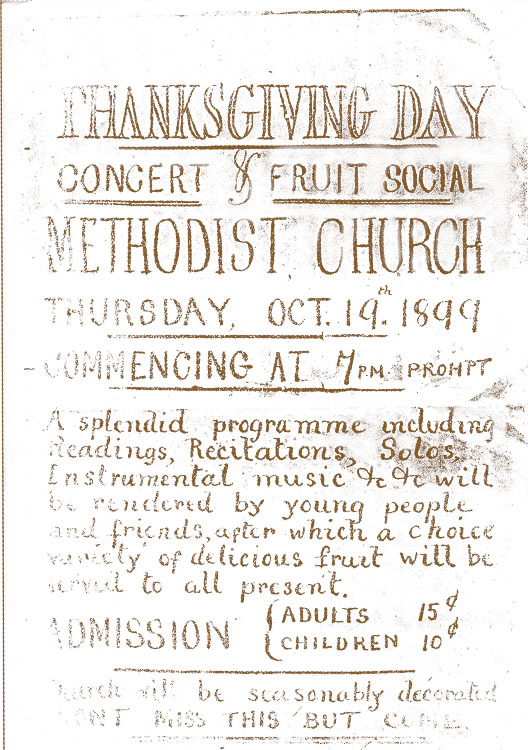 It became the United Church in 1925, when the Methodist Church of Canada joined with the Congregational Union of Canada, and 70 per cent of the Presbyterian Church of Canada. Today the church hosts services every two weeks throughout the year. It is also a venue for Remembrance Day commemorations and public speaking events organized by Metis Beach School. Former Sunday school teacher, Sherrill Shaver, tells us how this particular church had a big impact on her life. Today, the only traces remaining of the St. Lawrence House hotel are the low stone walls that bordered its entrance. 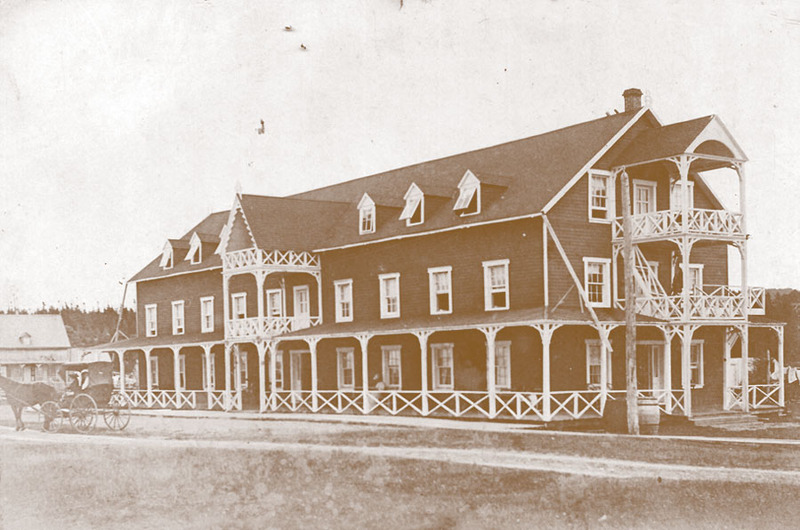 The original building was demolished in the 1950s, but you only need to look across the road to the West to understand why this was such a good spot for a hotel: the view of the bay and of the Metis Lighthouse, a well-known and well-loved feature of the local landscape, is stunning. The first lighthouse, built from wood, was opened in 1874; the building you see today replaced the original in 1909 as a stronger and more durable structure that could support the weight of a more powerful and heavier light. In 1918 a foghorn was added in a separate building. Fog on the Lower St. Lawrence was deemed a greater risk to shipping than the high seas and rocks. The foghorn had the secondary function of warning residents that it was not a good morning to get up early for golf! Metis Beach School is the only English school in the Lower Saint Lawrence region. Today, students travel up to 120 km every day to attend classes as they come from the four surrounding MRCs of La Mitis, Matane, Matapedia Valley and Rimouski. This is the fourth location in Metis to house the school, the first being in what is now Grand-Métis, to the west of Métis-sur-Mer. As the base of the population moved through time, so did the school. 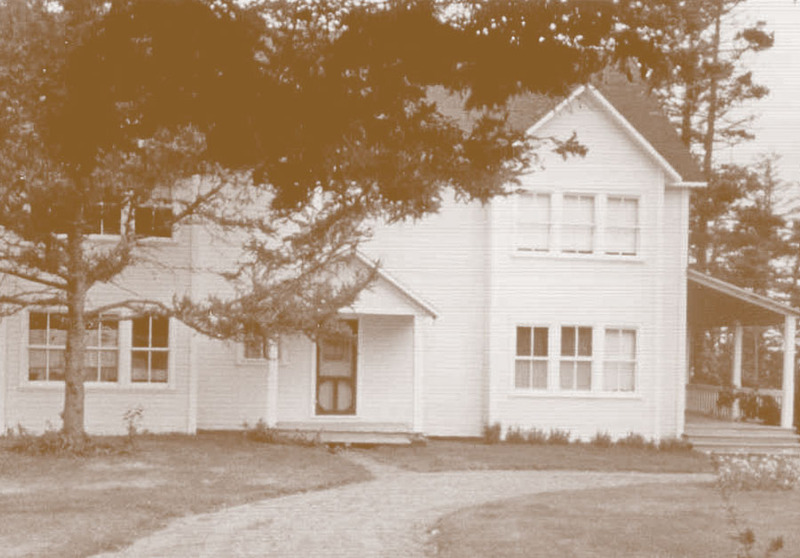 The original schoolhouse on this site was built in 1929. You can still see the original building at the back of the existing one. Originally built to house up to 30 students, in some years there were fewer than 10. The school now welcomes more than 75 students from Pre-Kindergarten to secondary 5, and it keeps growing. Retired teacher and Principal, Kathy Dodson, remembers what the school was like when she first started teaching here. 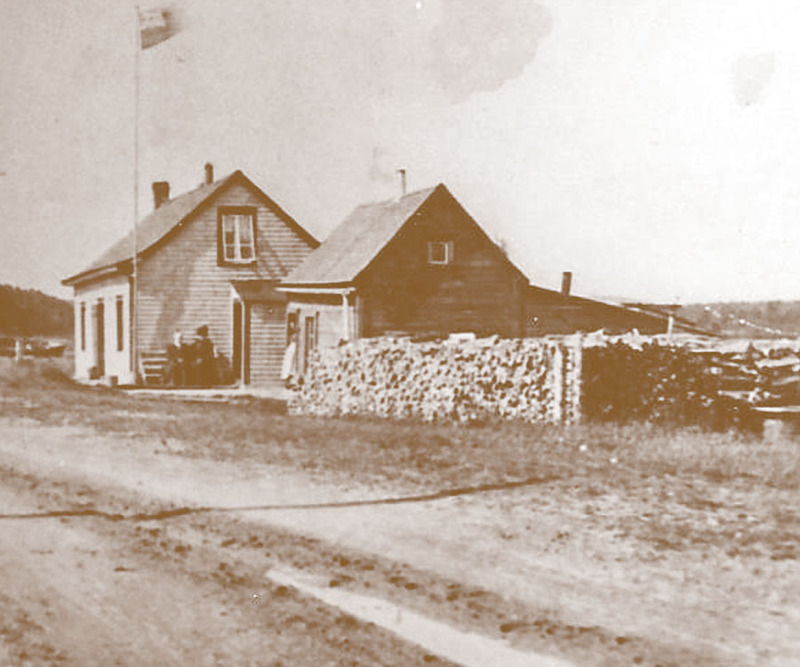 Robert Turriff, a farmer and the manager of the first hotel and the first sawmill in Metis, built 452 Beach circa 1870 on the river-side of the road. However, due to land erosion, high tides and storms, it was decided to move the house directly across the road in 1945. A good job too, as the house was originally situated behind the trees you now see at the edge of the river. To move it across the road, the house was put on rollers which were pulled by a horse-operated stump puller. 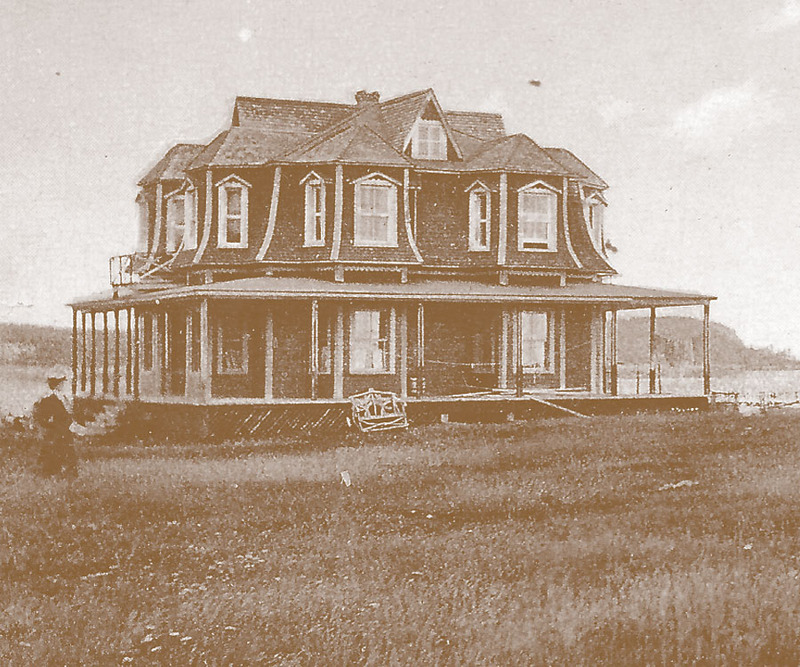 Riverside Cottage was built in 1898 by Robert Turriff and John Astle, two of the major landowners in Metis, as a wedding gift for their son and daughter, respectively. The house had its own water system even before there was one in the village. Grandson of the original owners, Bill Pearce, tells us about the work it has taken to preserve this piece of local history. You are now facing the land where Turriff Hall, the first of the Metis hotels, once stood. 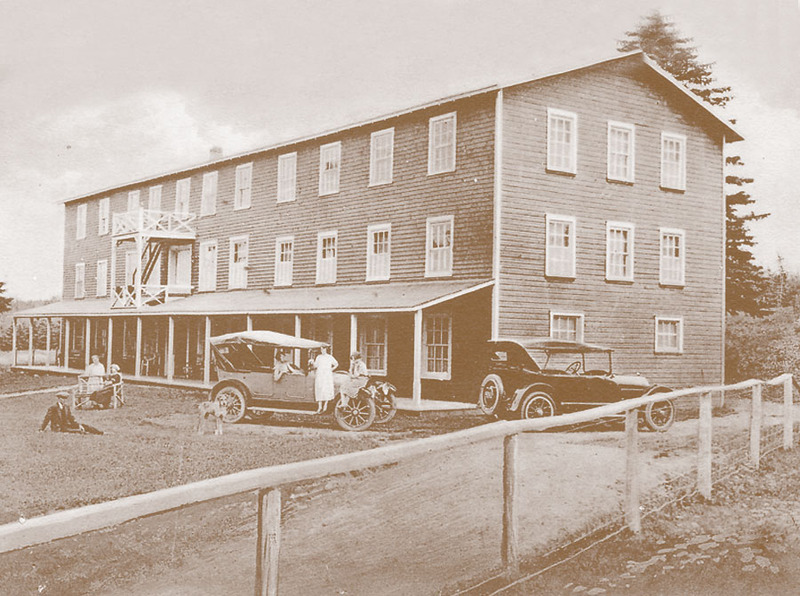 Built in 1862 by Robert Turriff, the walls of this 75-room hotel went from the east-side fence of the property, to the western wall of the garden shed. 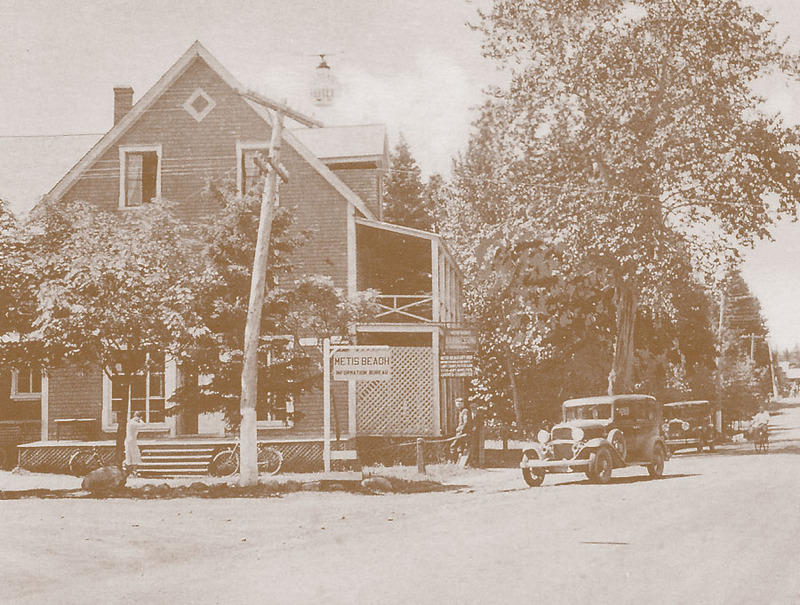 In the spring of 1941, the building was destroyed by fire. Thankfully, as it only opened during the summer months, no one was staying in the hotel when it burned down. Grandson of Robert Turriff, Lorn Turriff, tells us about the early days of Metis as a summer resort and his memories of the hotel. As with many of the Metis houses, the original house that was built here has been lost. Today, we see the Phareview but the first house at 414 Beach, Strabane Cottage, was built circa 1892 and appears to have served as inspiration for one of the Group of Seven at the start of the 20th Century. Hear how current owner and art enthusiast, Hart Price, made this remarkable discovery. While not yet an historic property (having been built in 1974) it is certainly worth noticing The Round House at 413 Beach for its unique design. Furthermore, as the materials for the house came from the surrounding land and local buildings that were being torn down, there are certainly parts of it which are over 100 years old. Rev. James Peter Jones, former minister at the Little Metis Presbyterian Church, explains his inspiration and how the Round House came about. You now stand at the bottom of a hill lined with fir trees and known locally as Grier’s Hill. The hill takes its name from George A Grier, a well-known Montreal lumber merchant, President of the St. Lawrence Flour Mill and Diamond Glass Co., and a director of the Dominion Textile Co., amongst other roles. 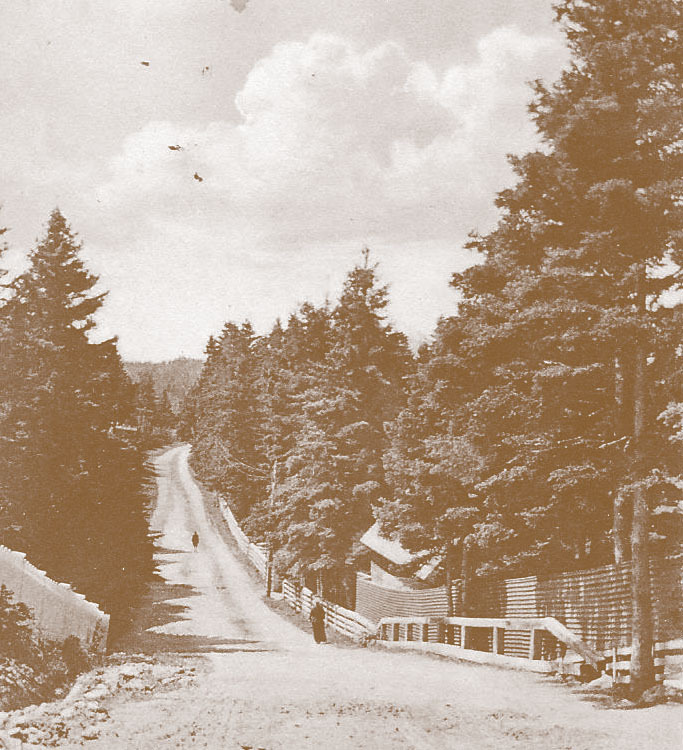 In 1890, when he first came to Metis, George built his house on this hill, at what is now 402 Beach. George’s great-great-granddaughter, Sally, tells us more about summers in Metis. You can find out more about Campbell’s, the store that Sally mentions, on the East Trail. Known locally as the Yellow Kirk (honouring the Scottish roots of the population) the Little Metis Presbyterian Church welcomes parishioners every summer. Although the church was built in 1883, the separate belfry was built later to accommodate a bell given to the church in 1923 by James Lowden, a parishioner and World War One veteran. Sadly, in the fall of 2013, the 500 kg brass bell was stolen from its place 28 feet above the ground. Long-time summer resident and trustee of the church, Anson McKim, explains the origin of the church and recalls a family story. 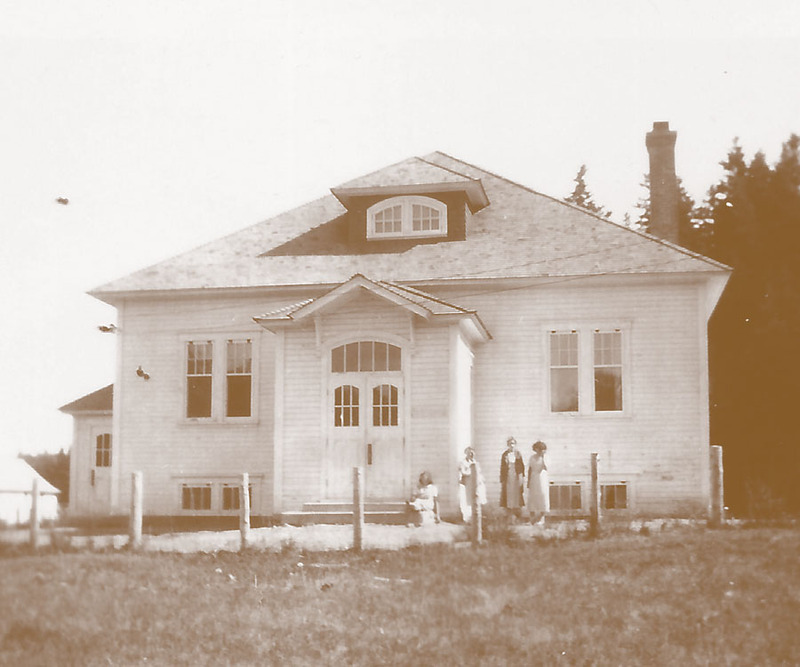 387 Beach was one of two “Hostess Houses” in Metis that were rented by the Royal Canadian Air Force (RCAF) during the Second World War. RCAF Station Mont-Joli, which was used as an RCAF bombing and gunnery school until 1945, rented these houses so that British Commonwealth pilots training at the airbase and living too far to be sent home when on leave, could relax in an English-speaking environment for a few days. Built during the early 1880s and originally called Union Hall (although we now know it as the Town Hall), this building was constructed to provide a non-denominational meeting place for the whole community. 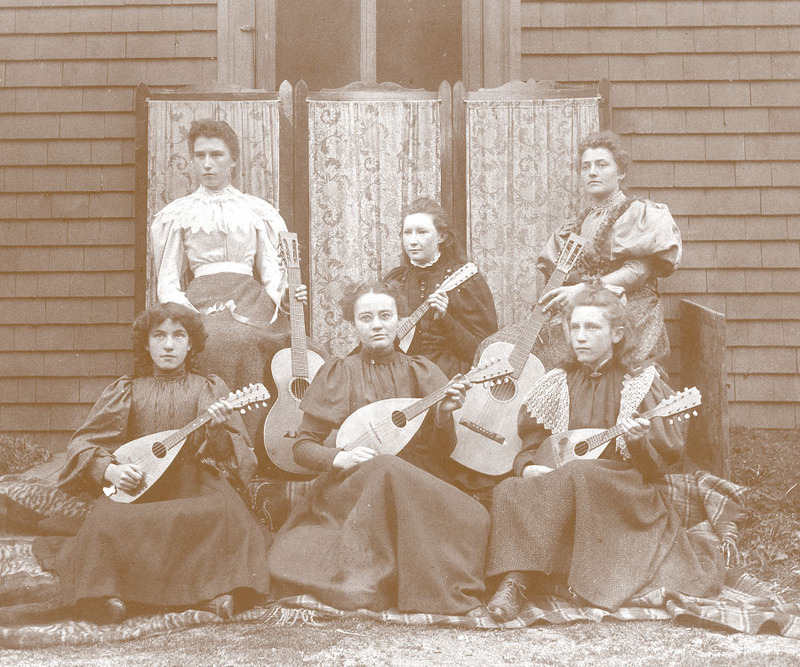 The idea came from a group of young women and girls (some as young as 8) who called themselves the Willing Workers, as they felt that the community needed a place where everyone could get together. Not only did they have the idea but they also raised the money to have the hall built by putting on concerts, organizing community suppers and doing work for community members. The hall was originally built across the road from where it now stands. The story goes that when the hall was moved down the hill in 1897, it was intended to be placed further back from the road but the effort to move it any further was simply too great so it was left where it now stands. 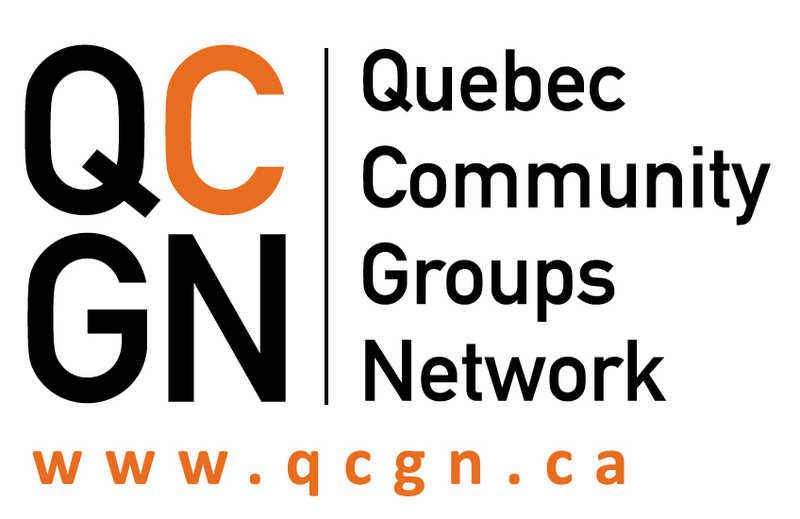 Evelyn Annett, President of the Association socio-culturelle de Métis-sur-Mer, tells us more about the role the Town Hall has played in the community. 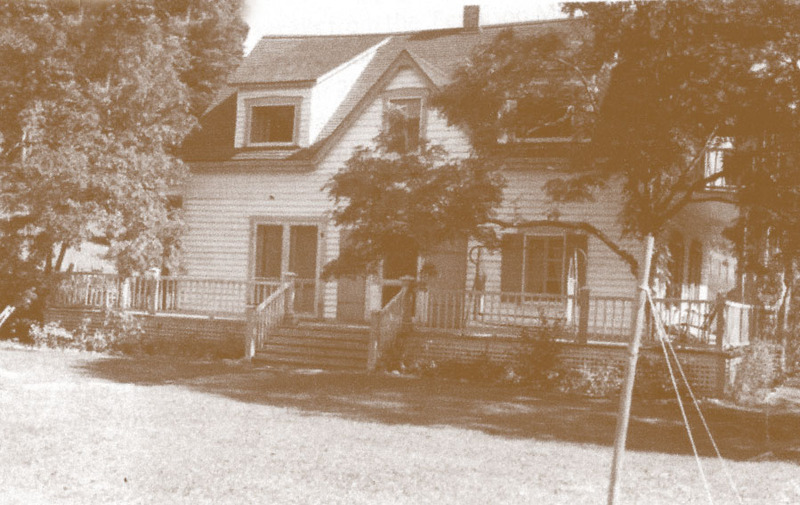 1 MacNider is one of a few houses which, for a long time, were owned by the MacNider family, descendants of the first Seigneur of Metis. Of the MacNiders, it was John (1760-1829) who is considered the father of Metis because from 1818, he arranged for a mass immigration of settlers from his native Scotland. To encourage the move, he provided the new families with two years of provisions and free rent. Although there were no real roads at the time, MacNider erected farms, a sawmill, a corn mill, a shipyard and dwelling houses. He influenced the establishment of Kempt Road (which you can find out more about on the East Trail). MacNider is largely responsible for developing what was initially an aboriginal fishing and gathering place, and making it into a thriving community, descendants of which still live here today. This particular building has had a number of uses over the years including a Post Office with an apartment for the postmistress, a telegraph office and a CN ticket office. Sherrill Shaver was appointed postmistress in 1942. She tells us about the bustle of living and working in this building. I’ve enjoyed this history of Little Metis very much. I have ancestors from Little Metis, the oldest being Joseph Sim, who arrived via McNider’s schooner, The Rebecca. My great-great-grandmother was named in part after McNider: Mary McNider Crawford Sim, b. 1822. If anyone knows of the Sim family, or is related to this family from Little Metis, I’d love to hear from you.